Hematoxylin and eosin stain of benign prostate gland. This article deals with stains. H&E isn't the only stain out there. Non-H&E stains are often referred to as special stains. Make sure one has exhausted the clinical history; history is considered the best special stain. Immunohistochemistry (dealt with in a separate article). AFB stains, e.g. Ziehl-Neelsen stain. Negative tissue is: light blue. One has to know where the target (of the antibody) is supposed to be, i.e. cytoplasm vs. cell membrane. The edge of the tissue may have light staining - edge effect. If everything is brown... suspect that it didn't work. In some situations you're blessed with an internal control, e.g. in renal tumours CD10 will stain RCC and the proximal tubule, in GISTs - CD117 the mast cells are positive. It often not possible to be definitive by staining. Gram stain - for bacteria. GMS stain - fungal stain. PAS (or PAS-D) - fungal stain. Fungi are a type of microorganisms. They are seen by pathologist every once in a while. What follows is a big list... of stains. An alternative to the H&E stain - some pathol. departments use this as their standard. Haematoxylin = blue -- stains nucleus. Phyloxin = pink -- stains muscle and cytoplasm. Saffron = yellow -- stains collagen. An alternative to H&E stain. Fibrosis is easier to see on HPS than H&E... as one can see the collagen. Positive in alpha-1 antitrypsin deficiency. Stains - lipofuscin, basement membranes, fungi, glycogen, (neutral) mucin. Magenta = glycogen, mucin, fungi. Washed-out light purple = Gram positive bacilli. This is much improved over the PAS in the context of skin, as the background is similar to the fungal organisms. "PAS diastase resistant" implies PASD +ve and PAS +ve. Used to identify glycogen (together with PAS stain). Glycogen = clear (digested) on PAS-D.
Glycogen = magenta on PAS. Light blue/pink = background. ??? GMS is "Grocott's methenamine Silver" according to WMSP. Pneumocystis jirovecii - cause of pneumocystis pneumonia (PCP). Histoplasma - cause of histoplasmosis. Histoplasma = black, round balls. Ziehl-Neelson stain - used to look for Mycobacterium tuberculosis. Fite stain - used to look for Mycobacterium leprae. Most popular acid-fast bacilli stain. Stains other mycobacteria -- not specific for tuberculosis. Another AFB stain - useful for cryptosporidiosis and microsporidiosis. Used to look for amyloid. Mnemonic: CRAP = congo red amyloid protein. An alternate stain for amyloid is Thioflavin T.
Thick sections (~10 micrometers) are considered a requirement for the stain to work properly. If the section is too thin... it doesn't work. "It is useless for finding bacteria." If they are to be seen... they'll be visible on H&E. Microbiology is better at finding organisms than pathology. They have one significant advantage -- if a small amount of bugs are present... they grows into a large (obviously visible) colony. Purple (or blue) = Gram positive organisms. Red = Gram negative organisms, nuclei. Many of the bacteria are quite small relative to lymphocytes; Escherichia coli is 1-2 micrometers long x 0.25 micrometers in diameter. Epithelial cell nuclei & stromal cell nuclei may stain red. Memory device: purple = positive. Blue = myelinated fibers (contain lipoproteins), lipofuscin. Lack of blue (where it ought to be) = demyelination. Purple = nerve cell (e.g. neuron). Useful for finding mast cells. Useful for finding Donovan bodies and Leishmania. Demonstrates the reticular fibers (in cirrhosis the fibers are disrupted). Sarcomas have reticulin around each cell. Carcinomas have reticulin around clusters of cells. In adenoma, reticulin highlights the lost acinar structure of normal pituitary gland. Separating schwannoma (basement membrane around each cell) from meingioma in cerebellopontine angle. Separating desmoplastic medulloblastoma from classic/anaplastic forms. Used at some places (e.g. SMH) to look for Helicobacter organisms. Everything is shades of blue. Useful for iron and hemosiderin; useful for differentiating brown pigments (melanin, lipofuscin, tattoo pigment, hemosiderin). Prussian blue stain - hemosiderin (vetmed.vt.edu). DDx of brown pigment: Fontana-Masson (melanin), Kluver-Barrera stain (lipofuscin). Useful for differentiating brown pigments (melanin, lipofuscin, tattoo pigment, hemosiderin). Useful to detect demyelinating lesions in the CNS. PAS also stains lipofuscin and is more commonly available. Blue pigmented granules = lipofuscin. DDx of brown pigment: Fontana-Masson (melanin), Prussian blue stain (hemosiderin). Corroborate diagnosis of lipoid pneumonia. Screen for GERD - positive staining seen in macrophages from BAL specimens. Must be done on fresh tissue, i.e. it cannot be fixed in formalin. Developed by a bunch of pathologists in Michigan to look for spirochetes. Find spirochetes, e.g. syphilis (Treponema pallidum), cat-scratch disease (Bartonella henselae). Find Helicobacter spp., e.g. Helicobacter pylori -- Mount Sinai Hospital. Considered a "dirty" stain - picks-up junk in the background. Considered a variant of the Steiner stain. Find spirochetes, e.g. syphilis (Treponema pallidum), donovan bodies (leishmaniasis), Helicobacter pylori and Bartonella henselae (Cat-scratch disease). Spirochetes - several images (med.sc.edu). Stains glial tissue, i.e. brain. Demonstrates neurofibrillary tangles, senile plaques (as in Alzheimer's disease). Black = axons, tangles, plaques. Brown/dark brown = plaque, vascular amyloid. Stains some mucins... uses the dye carmine. Malignant cells that produce mucin... carcinomas. Mucicarmine stained pancreatic adenosquamous carcinoma (nature.com). Stains acidic mucin (pH=2.5); Alcian blue = Acidic. Alcian blue (not otherwise specified) usu. refers to the pH=2.5. 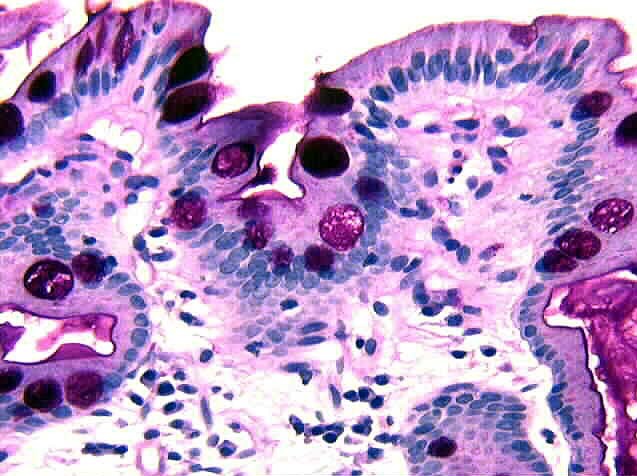 Identify intestinal metaplasia in the stomach and esophagus -- goblets = blue. Esophageal submucosal glands - alcian blue positive. Alcian blue stain, PASD stain, Mucicarmine stain. Sulfated alcian blue (abbreviated 'SAB) redirects here. Less specific than congo red but equally sensitive. Does not require polarized light. Other things that are green: mast cells, mucoid degeneration, basophilic myofibre degeneration, califications. Myxomatous degeneration of cardiac valves. Acid fuchsin, alcian blue, crocein scarlet, elastic hematoxylin, and saffron. Black = nuclei and elastic fibers. Yellow = collagen and reticular fibers. Blue = mucin, ground substance. How to remember? A.: Primary colours (red, blue, yellow) + black. Should not be confused with the Mallory trichrome stain. May be referred to as trichrome stain. Red = muscle (smooth muscle actin). "Elastic trichrome" is one important variant of Masson's trichrome. Black = nuclei and elastin. Should not be confused with Masson trichrome stain. May be done with elastin. Kidney Bx (to assess for fibrosis). Considered better than the Masson trichrome stain. Liver Bx (to assess for cirrhosis). Cardiovascular/lung (to see differentiate the layers of the arteries, and arteries from veins). It should not be confused with the HPS stain. AKA Methenamine PAS, abbreviated MPAS. Visualize basement membrane in kidney biopsies. Especially useful for the diagnosis of membranous nephropathy (MN). Chromophobe renal cell carcinoma vs. renal oncocytoma - chromophobe renal cell carcinoma +ve. Blue (granular cytoplasmic) staining is positive. ChRCC Hale's colloidal iron (diagnosticpathology.org). Often described as a "fastidious" (difficult/demanding) stain. A few staff think this is a totally useless stain. A variant exists known as the Muller and Mowry modification of Hale's colloidal iron stain (AKA Müller-Mowry stain). Actually stains phosphates and carbonates as a surrogate for calcium. May be useful in kidney biopsies. Stains mast cells, pneumocystis jirovecii. Dark blue - nuclei, mast cell granules (darker than nuclei). Mast cells stained with toluidine blue (biomedcentral.com). Many variants of this stain exist. Red - RBCs, eosinophil granules. Blue (basophilic) - lymphocyte cytoplasm. Purple - nuclear chromatin, neutrophil granules, platelets. Variant of the Romanowsky stain for rapid processing. Tends to "blow-up" cell, i.e. cells are larger vis-a-vis Pap stain. Proprietary variant of Romanowsky stain. Helicobacter gastritis - organisms are dark blue against a light blue background. A variant of the Romanowsky stain; popular in North American. A variant of the Romanowsky stain; popular in Europe. AKA Masson-Fontana stain, Fontana-Masson stain for melanin, melanin stain. Stains connective tissue and fibrin. Look for fibrinoid necrosis in vasculitis. Muscle and fibrin - red. Red blood cells - yellow. AKA Elastic van Gieson stain, abbreviated EVG. Similar to Masson Trichrome & Verhoeff stain. May be seen in Wilson's disease. Copper staining is a non-specific finding seen in many liver diseases; it is associated with impaired bile secretion. AKA Orcein stain for copper-protein. Used in muscle biopsies - used to find abnormal mitochondrial deposits. Dark green = muscle fibers. Bright red = mitochondria, red blood cells. Used to identify blood vessels and pleural invasion in lung cancer. Black = elastin fibres, granules in mast cells. Yellow = muscle, fibrin, erythrocytes. ↑ LAE. 13 July 2010. ↑ Woods GL, Walker DH (July 1996). "Detection of infection or infectious agents by use of cytologic and histologic stains". Clin. Microbiol. Rev. 9 (3): 382-404. PMC 172900. PMID 8809467. http://cmr.asm.org/cgi/pmidlookup?view=long&pmid=8809467. ↑ Kovi J, Leifer C (July 1970). "Lipofuscin pigment accumulation in spontaneous mammary carcinoma of A/Jax mouse". J Natl Med Assoc 62 (4): 287–90. PMC 2611776. PMID 5463681. http://www.ncbi.nlm.nih.gov/pmc/articles/PMC2611776/pdf/jnma00512-0077.pdf. ↑ Qizilbash, A.; Young-Pong, O. (Jun 1983). "Alpha 1 antitrypsin liver disease differential diagnosis of PAS-positive, diastase-resistant globules in liver cells.". Am J Clin Pathol 79 (6): 697-702. PMID 6189389. ↑ 7.0 7.1 7.2 7.3 Humphrey, Peter A; Dehner, Louis P; Pfeifer, John D (2008). The Washington Manual of Surgical Pathology (1st ed.). Lippincott Williams & Wilkins. pp. 682. ISBN 978-0781765275. ↑ URL: http://library.med.utah.edu/WebPath/HISTHTML/MANUALS/FITES.PDF. Accessed on: 19 May 2011. ↑ URL: http://library.med.utah.edu/WebPath/LUNGHTML/LUNG024.html. Accessed on: 19 May 2011. ↑ Kehl, KS. ; Cicirello, H.; Havens, PL. (Feb 1995). "Comparison of four different methods for detection of Cryptosporidium species.". J Clin Microbiol 33 (2): 416-8. PMID 7536216. ↑ Ignatius, R.; Lehmann, M.; Miksits, K.; Regnath, T.; Arvand, M.; Engelmann, E.; Futh, U.; Hahn, H. et al. (Feb 1997). "A new acid-fast trichrome stain for simultaneous detection of Cryptosporidium parvum and microsporidial species in stool specimens.". J Clin Microbiol 35 (2): 446-9. PMID 9003613. ↑ URL: http://www.ihcworld.com/_protocols/special_stains/congo_red_bennhold.htm. Accessed on: 26 January 2012. ↑ URL: http://library.med.utah.edu/WebPath/HISTHTML/MANUALS/CONGORED.PDF. Accessed on: 4 December 2010. ↑ St. Michael's Hospital - Stains Handout. ↑ URL: http://www.atsu.edu/faculty/chamberlain/Website/pnebact.htm. Accessed on: 7 May 2013. ↑ URL: http://meded.ucsd.edu/isp/1999/CAP/legion.html. Accessed on: 7 May 2013. ↑ URL: http://library.med.utah.edu/WebPath/HISTHTML/MANUALS/GRAM.PDF. Accessed on: 7 May 2013. ↑ MUN. 26 November 2010. ↑ URL: http://library.med.utah.edu/WebPath/HISTHTML/STAINS/STAINS.html. Accessed on: April 6, 2009. ↑ URL: http://www.kennedy.ox.ac.uk/facilities/histology/histology-information. Accessed on: 17 August 2015. ↑ URL: http://amser.org/index.php?P=AMSER--ResourceFrame&resourceId=6018. Accessed on: 17 August 2015. ↑ MACKENZIE DH (March 1958). "Reticulin patterns in the diagnosis of carcinomas and sarcomas". Br. J. Cancer 12 (1): 14–9. PMC 2074006. PMID 13536209. //www.ncbi.nlm.nih.gov/pmc/articles/PMC2074006/. ↑ Prussian blue stain. URL:[http://education.vetmed.vt.edu/curriculum/VM8054/labs/Lab2/Examples/exprussb.htm. Accessed on: 5 May 2010. ↑ Kluver-Barrera stain. URL:http://education.vetmed.vt.edu/curriculum/VM8054/labs/Lab2/Examples/exkluvbarr.htm. Accessed on: 5 May 2010. ↑ Yampara Guarachi, GI. ; Barbosa Moreira, V.; Santos Ferreira, A.; Sias, SM. ; Rodrigues, CC. ; Teixeira, GH. (2014). "Lipoid pneumonia in a gas station attendant.". Case Rep Pulmonol 2014: 358761. doi:10.1155/2014/358761. PMID 25374742. ↑ Hopkins, PM. ; Kermeen, F.; Duhig, E.; Fletcher, L.; Gradwell, J.; Whitfield, L.; Godinez, C.; Musk, M. et al. (Aug 2010). "Oil red O stain of alveolar macrophages is an effective screening test for gastroesophageal reflux disease in lung transplant recipients.". J Heart Lung Transplant 29 (8): 859-64. doi:10.1016/j.healun.2010.03.015. PMID 20466562. ↑ URL: http://www.merriam-webster.com/medical/warthin. Accessed on: 17 August 2010. ↑ DB. 4 August 2010. ↑ URL: http://www.mayomedicallaboratories.com/test-catalog/Overview/80327. Accessed on: 8 August 2010. ↑ Humphrey, Peter A; Dehner, Louis P; Pfeifer, John D (2008). The Washington Manual of Surgical Pathology (1st ed.). Lippincott Williams & Wilkins. pp. 455. ISBN 978-0781765275. ↑ URL: http://www.mondofacto.com/facts/dictionary?Dieterle%27s+stain. Accessed on: 4 August 2010. ↑ Lefkowitch, Jay H. (2006). Anatomic Pathology Board Review (1st ed.). Saunders. pp. 681 (Q25). ISBN 978-1416025887. ↑ Humphrey, Peter A; Dehner, Louis P; Pfeifer, John D (2008). The Washington Manual of Surgical Pathology (1st ed.). Lippincott Williams & Wilkins. pp. 678. ISBN 978-0781765275. ↑ URL: http://www.pathologyoutlines.com/topic/stainsalcianblue.html. Accessed on: 11 October 2012. ↑ URL: http://library.med.utah.edu/WebPath/HISTHTML/MANUALS/ALCIAN.PDF. Accessed on: 20 December 2011. ↑ 45.0 45.1 Pomerance, A.; Slavin, G.; McWatt, J. (Jan 1976). "Experience with the sodium sulphate-Alcian Blue stain for amyloid in cardiac pathology.". J Clin Pathol 29 (1): 22-6. PMID 55419. ↑ URL: http://www.polyrnd.com/products/reagent-assembly-kits/conventional/amyloid-stain---sulfated-alcian-blue-(sab).aspx. Accessed on: October 15, 2014. ↑ 48.0 48.1 Modified Movat's Pentachrome Stain. University Penn Medicine. URL: http://www.med.upenn.edu/mcrc/histology_core/movat.shtml. Accessed on: January 29, 2009. ↑ ULR: http://library.med.utah.edu/WebPath/HISTHTML/MANUALS/MASSONS.PDF. Accessed on: 2 November 2011. ↑ Perry JR, Bilbao JM, Gray T (1992). "Fatal basilar vasculopathy complicating bacterial meningitis". Stroke 23 (8): 1175–8. PMID 1636194. Free Full Text. ↑ Jones, DB.. "Nephrotic glomerulonephritis.". Am J Pathol 33 (2): 313-29. PMC 1934622. PMID 13402889. //www.ncbi.nlm.nih.gov/pmc/articles/PMC1934622/. ↑ URL: http://library.med.utah.edu/WebPath/HISTHTML/MANUALS/JONES.PDF. Accessed on: 19 May 2011. ↑ Tickoo SK, Amin MB, Zarbo RJ (April 1998). "Colloidal iron staining in renal epithelial neoplasms, including chromophobe renal cell carcinoma: emphasis on technique and patterns of staining". Am. J. Surg. Pathol. 22 (4): 419–24. PMID 9537468. http://meta.wkhealth.com/pt/pt-core/template-journal/lwwgateway/media/landingpage.htm?issn=0147-5185&volume=22&issue=4&spage=419. ↑ URL: http://www.merriam-webster.com/dictionary/fastidious?show=0&t=1319550566. Accessed on: 25 October 2011. ↑ ALS. On several occasions in 2009. ↑ Mete, O.; Kilicaslan, I.; Gulluoglu, MG.; Uysal, V. (Dec 2005). "Can renal oncocytoma be differentiated from its renal mimics? The utility of anti-mitochondrial, caveolin 1, CD63 and cytokeratin 14 antibodies in the differential diagnosis.". Virchows Arch 447 (6): 938-46. doi:10.1007/s00428-005-0048-6. PMID 16133362. ↑ Rungby, J.; Kassem, M.; Eriksen, EF. ; Danscher, G. (Jun 1993). "The von Kossa reaction for calcium deposits: silver lactate staining increases sensitivity and reduces background.". Histochem J 25 (6): 446-51. PMID 8360080. ↑ Fischer EG, Moore MJ, Lager DJ (October 2006). "Fabry disease: a morphologic study of 11 cases". Mod. Pathol. 19 (10): 1295–301. doi:10.1038/modpathol.3800634. PMID 16799480. http://www.nature.com/modpathol/journal/v19/n10/abs/3800634a.html. ↑ Nicholas, SB. ; Basgen, JM. ; Sinha, S. (2011). "Using stereologic techniques for podocyte counting in the mouse: shifting the paradigm.". Am J Nephrol 33 Suppl 1: 1-7. doi:10.1159/000327564. PMID 21659728. ↑ URL: http://www.molecularstation.com/protocol-links/articles/Toluidine-Blue-Stain-32.html. Accessed on: 17 March 2011. ↑ URL: http://www.dermnetnz.org/doctors/dermatopathology/stains.html. Accessed on: 17 March 2011. ↑ Horobin RW, Walter KJ (1987). "Understanding Romanowsky staining. I: The Romanowsky-Giemsa effect in blood smears". Histochemistry 86 (3): 331–6. PMID 2437082. http://www.springerlink.com/content/r81x25451m841866/. ↑ URL: http://www.ihcworld.com/_protocols/special_stains/diff_quick_ellis.htm. Accessed on: 4 January 2010. ↑ URL: http://www.ihcworld.com/_protocols/special_stains/diff_quick_ellis.htm. Accessed on: 30 August 2012. ↑ Gaitanis, G.; Chasapi, V.; Velegraki, A. (Aug 2005). "Novel application of the masson-fontana stain for demonstrating Malassezia species melanin-like pigment production in vitro and in clinical specimens.". J Clin Microbiol 43 (8): 4147-51. doi:10.1128/JCM.43.8.4147-4151.2005. PMID 16081962. ↑ URL: http://library.med.utah.edu/WebPath/HISTHTML/STAINS/STAINS.html. Accessed on: 5 May 2010. ↑ URL: http://www.bris.ac.uk/vetpath/cpl/msb.html. Accessed on: 26 November 2010. ↑ "Picro-Mallory for Fibrin – Long Version". http://stainsfile.info/StainsFile/stain/fibrin/picro-mallory-1.htm. Retrieved 17 January 2011. ↑ URL: http://education.vetmed.vt.edu/Curriculum/VM8054/Labs/Lab2/Examples/exvrmass.htm. Accessed on: 3 January 2011. ↑ URL: http://education.vetmed.vt.edu/Curriculum/VM8054/Labs/Lab2/Examples/exvvg.htm. Accessed on: 3 January 2011. ↑ Miyamura H, Nakanuma Y, Kono N (December 1988). "Survey of copper granules in liver biopsy specimens from various liver abnormalities other than Wilson's disease and biliary diseases". Gastroenterol. Jpn. 23 (6): 633–8. PMID 2464523. ↑ URL: http://www.naika.or.jp/im2/42/10/14c.aspx. Accessed on: 24 January 2011. ↑ http://www.mayomedicallaboratories.com/test-catalog/Overview/9836. Accessed on: 24 January 2011. ↑ URL: http://informahealthcare.com/doi/abs/10.3109/00313027709085239?journalCode=pat. Accessed on: 24 January 2011. ↑ Ghosh, AK. ; Dasgupta, A.; Raha, K.; Jana, A.; Majumdar, DN. (Oct 1994). "Hepatic histology in chronic liver disease in hepatitis B surface antigen positive cases.". J Indian Med Assoc 92 (10): 333-5. PMID 7822848. ↑ URL: http://www.nottingham.ac.uk/pathology/protocols/shikata.html. Accessed on: 24 January 2011. ↑ GOMORI, G. - A rapid one-step trichrome stain. Am. J. Clin. Path. 20: 661-664, 1950. ↑ URL: https://www.ihcworld.com/_protocols/special_stains/miller's_elastic_ellis.htm. Accessed on: 28 August 2015. Special stains (introduction) - med.utah.edu.